T. Aberra, S. W. Armfield, M. Behnia, & G. D. McBain 2012 Boundary layer instability of the natural convection flow on a uniformly heated vertical plate. International Journal of Heat and Mass Transfer 55(21–22):6097–6108. S. Jiracheewanun, S. W. Armfield, M. Behnia, & G. D. McBain 2004 The transient behaviour of a differentially heated cavity with isoflux boundaries. 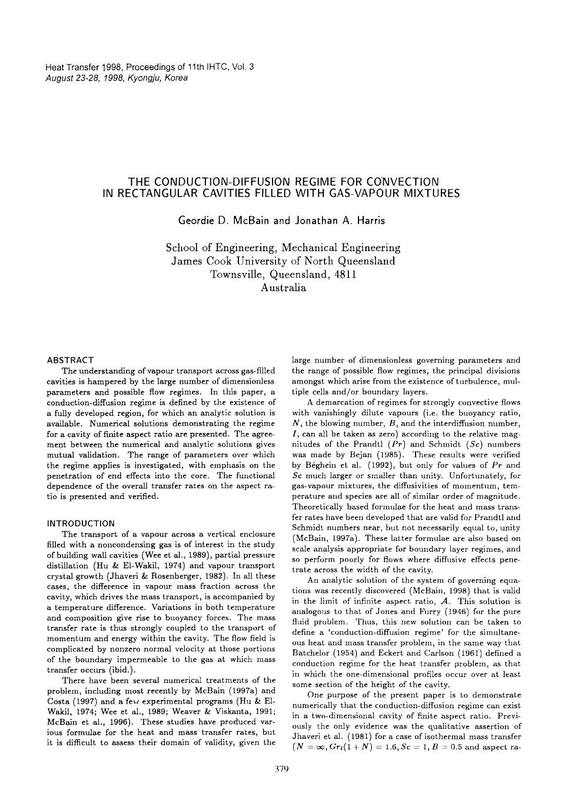 In M. Behnia, W. Lin, & G. D. McBain (eds) Proceedings of the Fifteenth Australasian Fluid Mechanics Conference, The University of Sydney, Paper AFMC00246. C. M. Downing & G. D. McBain 2000 Towards understanding the pressure dependence of hygroscopic water. In D. M. Hogarth (ed.) Proceedings of the Australian Society of Sugar Cane Technologists, pp. 361–367. Last modified Tue. 14 Mar. 2017 by Geordie McBain.